Full color two sided uncoated poker chip. 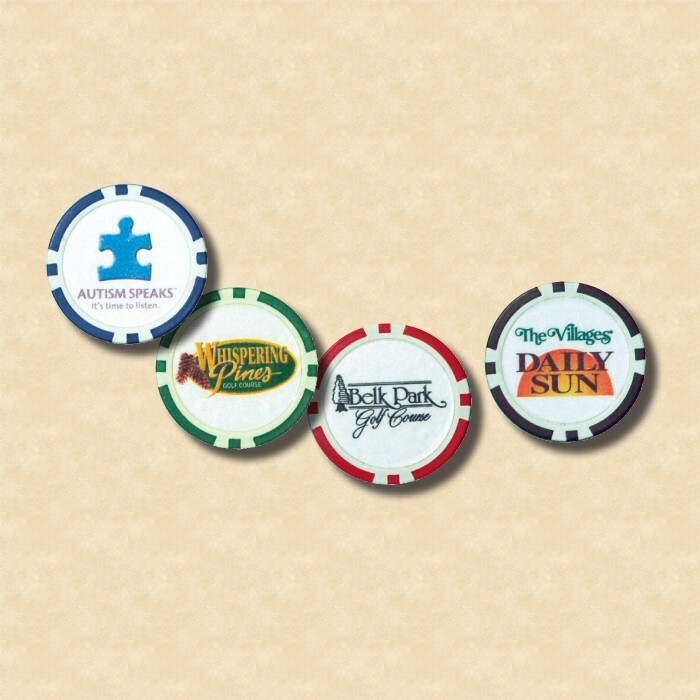 Famously popular poker chips. Use as large ball marker, game chip or token. Great giveaway for golf events, tokens, coupon giveaways, parties, weddings, engagements, Bar/Bat Mitzvahs, anniversaries, raffles prizes, announcements, special events, fundraisers and business cards. Used by golf courses, event planners, banks, insurance companies, internet companies, transportation co., retailers, wholesalers and manufacturers. Price Includes: Materials: Imprint Method: IMPRINT METHOD 4 Color Imprint IMPRINT CHARGE (Printed) Set Up Charge $50 (V) IMPRINT SIZE diameter on each side 1"